The Quebec government’s decision to increase taxes on alcohol for bars and restaurants isn’t sitting well with the local tourism industry. On Monday afternoon, about a hundred protesters—mostly bar and restaurant owners—gathered at Place des Arts to raise concerns about the new tax, proposed by Pauline Marois’s Parti Québécois government in its newly released 2013-2014 budget. The tax imposes a $0.50 increase per litre of wine or spirits and a $0.17 hike for beer. Those in the industry are arguing that the tax is retroactive—seeing as it applies to alcohol already purchased by restaurant and bar owners. They are required to pay the difference before the end of the year. “The mismanagement of government—going back in to tax more to fix their mistake—will bring us all down,” said Paul Quinn, owner of the Irish Embassy Pub. David McMillan, owner of Joe Beef and Liverpool House restaurants, echoed Quinn. “The tax is stupid and the retroactive tax is an insult—you can’t squeeze the lemon until there is no more juice left in it,” he said. Many argue the tax will only further hurt the tourism industry in Montreal, already struggling to compete with its American neighbours. “The prices in the United States are one-third of what they are here,” said Steve Siozios, president of the Crescent Street Merchants Association and owner of Stogies Cigar Lounge and the London Pub. But with the current exchange rate—the Canadian dollar almost at parity with the American one—Quebec businesses are suffering. “[Montreal] is one of the hardest places to open a business, and [the government is] making it even worse,” said Siozios. They left peacefully five minutes later. Siozios said that it is the employees—most of whom are students—who stand to lose the most, and for many, working conditions are already tough. Restaurant and bar owners are also limited in the pressure tactics they can use against the government. “There are 200,000 people who work in our industry but we get no respect because we are 8,000 small businesses trying to survive,” said Siozios. Future demonstrations and actions are in the works. “Potentially, next Monday, we’re talking about closing down across Montreal, across Quebec,” said Sandy White, president of the Quebec Nightlife Association, an organization created one year ago. 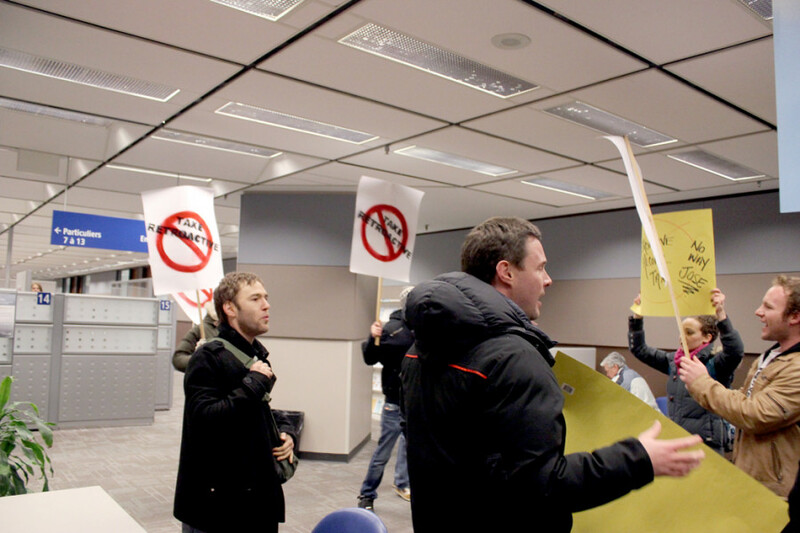 While striking isn’t a viable option, the owners are exploring other avenues. The Quebec Nightlife Association has launched a petition denouncing the new retroactive tax, which had accumulated over 250 signatures by press time.